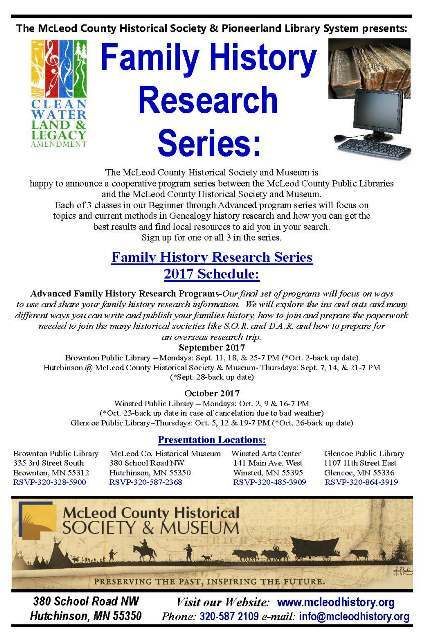 Beginning in October, the McLeod County Historical Society and Museum is happy to announce a cooperative program series between the McLeod County Public Libraries and the McLeod County Historical Society and Museum. Each of 3 classes in this series will focus on topics and current methods in genealogy history research and how you can get the best results and find local resources to aid you in your search. The Museum has brought together a team of local genealogists who have spent decades doing their own family history research. McLeod County Historical Society & Museum website. Minnesota’s Arts and Cultural Heritage fund. « Are You Ready to BUILD AN AWESOME SUMMER?